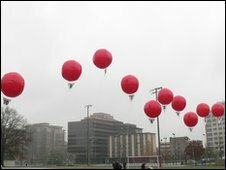 The US defence research agency has used 10 red balloons in a contest to assess the accuracy with which information spreads on the internet. The giant moored weather balloons were launched on Saturday morning at 10 undisclosed locations across the United States. More than 4,000 groups competed to be the first to pinpoint all 10. A team from the Massachusetts Institute of Technology (MIT) won the challenge and a prize of $40,000 (£24,000). Johanna Jones, a spokeswoman for the US Defense Advanced Research Projects Agency (Darpa), said that beyond the actual contest, the aim was to see whether social networking sites like Facebook and Twitter should be seen as credible sources of information. Darpa is no stranger to innovative uses of technology. The agency - which is part of the US defence department - played a pivotal role in the creation of the internet itself. Forty years on, with the internet in full swing, the same agency was keen to see if the power of social networking sites - with their tens of millions of users - could be used as a credible source to alert authorities of impending disaster or unrest on US soil.